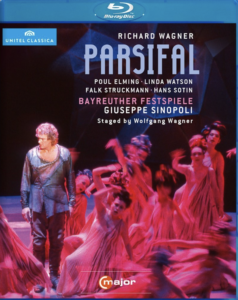 In the words of Opern Welt, Sinopoli “conjures up sounds of exquisite beauty and compelling poignancy.” Wolfgang Wagner’s production emphasizes the celebratory character of the libretto, which harmonizes superbly with Sinopoli’s insistence on the poetry and mystery of the music. A major role in the staging is played by the lighting, which is used to create stunning effects such as the diffuse play of light and shadow at the illumination of the Holy Grail. One of the production’s most striking moments occurs when the director has Kundry unveil the Grail instead of dying. She thus takes full part in the Grail ceremony, displaying a feminism which, in the Bayreuth context, is truly revolutionary.